Today I am sharing my favorite pins from Pinterest. One thing I really love about Pinterest is all the neat things you can find to either purchase or create in the ever growing community. If you are a golfer and a wife then this adorable golf glove is perfect for you! As soon as I saw this pin I sent it off to my honey! If you don’t love this color - check out the site they have so many to choose from! To tag along with the golf glove, when the honey takes me golfing I am awful at remembering my stroke count! He makes fun of me all the time and somehow he’s able to remember mine and his! Due to this I found this adorable stroke counter that hooks to your skourt! I love the colors that it comes in! While we are on the subject of accessories, I just adore this key chain from Kate Spade. Anything with tea or tea cups and I am in! I love a good high tea. As summer approaches I know that most of us will begin to travel more and more. I have had my eye on these suitcases by StreamLine Luggage FOREVER! I am so in love with them! There is something about lemons for me that just make me incredibly happy! Maybe that’s why I have 4 different lemon items in this roundup! The first is this adorable handbag by Kate Spade. Next is this dress that I thing is perfect for any sunny day. It is by Dolce & Gabbana. If you are not a dress person give this skirt a try, also by Dolce & Gabbana! 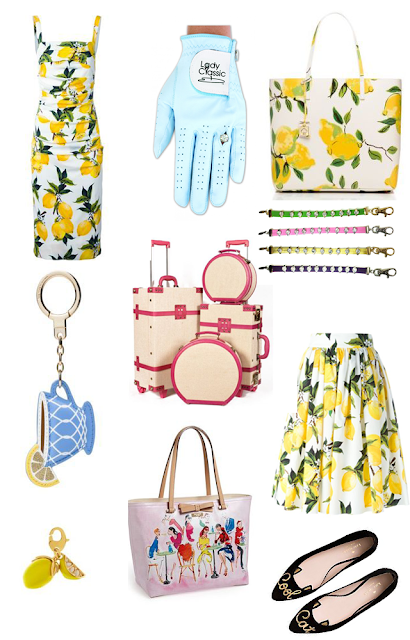 Lastly if you want a subtle touch of lemon, try this adorable Kate Spade lemon charm. I defiantly will be adding this to mine! I have adored this handbag by Kate Spade ever since I ran across it. The name is just as cute as the bag, “francis - ooh la la’ tote”. It reminds me of Paris, France and coffee which are two things that make me happy! I have thought about treating myself to this bag since I love it so much! Are you finding the trend yet? I feel like Kate Spade is my ideal style brand. These shoes are a prime example! If you are a cat lover or know a cat lover, save this for a future Christmas gift. One of my favorite things about Pinterest, other than being able to find anything on there, is the fact that almost each image leads you to a new site where you can find so much more. I have a feeling thats why we all end up down the rabbit hole.